Jazz music will fill the streets of Downtown Lakewood this Friday, July 8, when the second 2016 installment of LakewoodAlive’s Front Porch Concert Series gets underway. Powerhouse 5 will delight concert-goers by performing a blend of energetic jazz and familiar melodies from 7 to 9 p.m. at Lakewood Public Library. 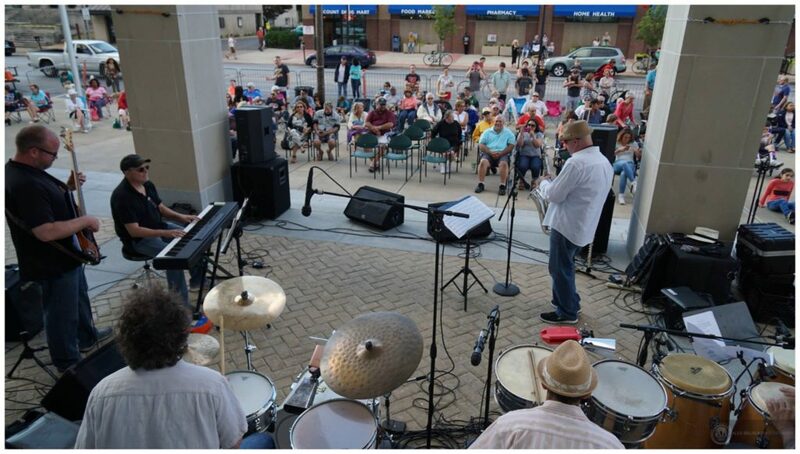 Sponsored by Bentley Wealth Management of Raymond James, the Front Porch Concert Series features free, live music on the front porch of Lakewood Public Library (15425 Detroit Avenue) in Downtown Lakewood for 11 consecutive Fridays. The series, which aims to foster and sustain Lakewood’s vibrancy while providing a family-friendly summer entertainment option, runs through September 9. The July 8 edition brings to the stage Powerhouse 5, which offers a jazz sound reminiscent of the 1930-50s with elements of big band, swing and electronica. The band will perform songs by the late Raymond Scott, an American composer whose music has long influenced cartoon soundtracks, ranging from Looney Tunes to The Simpsons. An ensemble of six musicians from Northeast Ohio, Powerhouse 5 consists of Darren Allen on drums and percussion, George Foley on piano and vocals, Larry Herman on trumpet, Tom Lempner on tenor saxophone, Bill Nichols on bass and Don Turoso on clarinet. The Front Porch Concert Series is generously supported by the following sponsors: Bentley Wealth Management of Raymond James, City of Lakewood, Cox Communications, Cuyahoga Arts & Culture, Discount Drug Mart, Lakewood Public Library, Lion & Blue, Paisley Monkey, Pillars of Lakewood and Vance Music Studio.